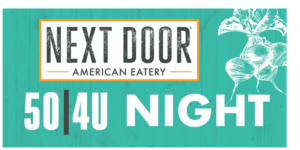 Next Door American Eatery (Formerly The Kitchen Next Door) is a very generous community partner supporting many local nonprofits and schools with the best dining night out option around! Enjoy a meal at Next Door on Monday, January 28, between 5pm and 9pm and they will donate 50% of your check total, including food and drinks, to the Boulder Chorale. You must register here to be included in the fundraiser.